May 2nd 2018, Visakhapatnam Andhra Pradesh : SYNERGIES CASTINGS LIMITED, India’s leading aluminium alloy wheel manufacturer announced the signing of an MOU with the Government of Andhra Pradesh in the presence of the Honourable Chief Minister Sri. 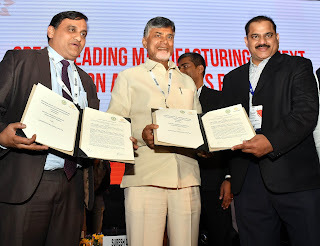 Chandrababu Naidu; to establish a major greenfield aluminium casting and specialty alloy wheel manufacturing facility in Visakhapatnam, Andhra Pradesh, INDIA. This new greenfield facility with an annual production capacity of 2.4 million wheels per year, benchmarked at 18” wheel size will have the most sophisticated casting, machining, painting facilities with embedded digital manufacturing technologies; to offer its’ Customers the best possible product at the most competitive prices. The Project cost of $100 million will be financed by the existing shareholders, accruals and bank debt. This agreement with the state of Andhra Pradesh sets the stage for building one of the largest single location alloy wheel manufacturing projects, with intent to expand this to 5 million wheels in multiple phases. Mr. Shekhar Movva, President SYNERGIES CASTINGS LIMITED, commented, “As customer requirements become exceedingly more stringent, and consequent need to invest in substantial capex for sophisticated production, testing and development facilities, it is important to scale up and tech-up to remain competitive. While we have evaluated several manufacturing location options in the country, we believe that Vizag, and the terms of engagement with the state of Andhra Pradesh offers the best opportunity to be the most competitive manufacturer of Alloy wheels in the country. Further, with the GST regime on, there is no penalty to moving goods across geographies and thus large-scale manufacturing makes sense.” This initiative is in sync with the Government’s push to make Andhra Pradesh an automobile hub of the future. Together with its ancillaries, this venture will provide more than 2000+ skilled jobs in the region. SYNERGIES the pioneer and leader in manufacturing alloy wheels in India, located in the VSEZ Visakhapatnam, has been supplying to leading OEMs in India and overseas for more than 17+ years now. Its wheels have adorned several iconic vehicles such as the Hummer, the Escalade, the Jeep, amongst others. SYNERGIES is a globally approved alloy wheels supplier to several automobile majors like General Motors-USA, Ford-USA, Chrysler-USA, General Motors-India, Ford-India, TATA Motors, Toyota, Hyundai, Fiat, Volkswagen, Honda and Mahindra & Mahindra amongst others, and is amongst India’s leading exporters. The Company has earned several prestigious awards over the years including awards for the highest exports, for the highest quality from Toyota, Chrysler, etc., as well as Global Best Quality Supplier Award from General Motors in 2013 and 2015.